Thanksgiving is a time of year for thankfulness, tradition, and family. It’s also a time of stressful preparation! Between hosting guests, purchasing ingredients and drinks, and getting everything else ready, it can be a nerve-wracking holiday. Start a new tradition with your family this year that you can be thankful for by coming to Santa Fe for Thanksgiving dinner! Whether you are looking for time with loved ones or historical events, Santa Fe is the place for you. Enjoy a cornucopia of wonderful meals and celebrations in town during your holiday visit to Four Kachinas. 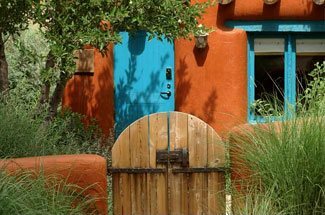 If you’re planning a trip to Santa Fe, New Mexico, take advantage of our free Vacation Guide! Planning a vacation can be hard, so we’ve narrowed down our favorite things to do in the area to save you from hours of research. Skip the tedious part of preparations! Use our guide to find everything from the best restaurants in town to fun activities in the area. It’s perfect for finding recommendations on what to do while you’re in Santa Fe for Thanksgiving dinner! Indulging in the smorgasbord of Thanksgiving cuisine is a must during this holiday! One of the best parts about staying at Four Kachinas for Thanksgiving is enjoying the meal without the hours of preparation and cleanup. With over 150 restaurants to choose from in the downtown area, you will have no problem figuring out where to go. Dinner for Two offers a variety of classics that usually includes choices of turkey, ham, potatoes, fruit stuffing, and more. Geronimo usually serves French cuisine with an eclectic global twist, but on Thanksgiving offers a three-course menu that will not disappoint. Make a reservation, then pile on that turkey, cranberry sauce, and stuffing! One great way to celebrate a Santa Fe Thanksgiving dinner is to pay tribute to the very first Thanksgiving. The city has a rich history and culture made up of many influences, including Native Americans. Today, Santa Fe is still a portal to Native American artwork and handmade goods that you can’t find anywhere else. When you stay at Four Kachinas, you can see the Native American influence in our decor as well as the surrounding area. Honor Native American culture by attending the Winter Indian Market, which is held each year the weekend after Thanksgiving. This great cultural display includes handcrafted Native American art and native cuisine. Enjoy Navajo blue corn pancakes and more traditional delicacies! Whether you bring your entire family or just your other half to Santa Fe for Thanksgiving dinner, Four Kachinas is the place for you. Modern luxury meets Southwestern charm at our bed and breakfast. Our location is just moments away from downtown yet tucked away in our own Santa Fe oasis. Enjoy modern amenities balanced by a homey experience. You are sure to love the authenticity provided by our original Native American, Spanish Colonial, and regional art, along with locally handcrafted furnishings in all of our accommodations. 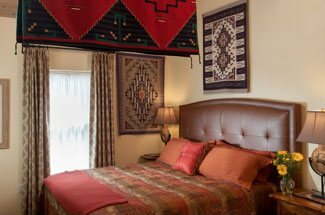 You will feel like Four Kachinas is your home away from home during your Thanksgiving getaway! Book your holiday trip today!